Bath. 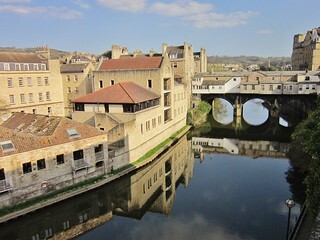 With its cultural, intellectual and social resources, the United Nations has recognized Bath as a World Heritage City. Living centrally in this compact and cosmopolitan environment provides ample opportunity for students to interact with and discover the city, quickly becoming residents of this dynamic community, rather than merely visitors. Hobart and William Smith Colleges maintain an affiliation with Advanced Studies in England (ASE). ASE, in association with University College, Oxford, provides opportunities for students to participate in a semester-length program in England. This program is based in the beautiful 18th century city of Bath, where students are integrated into British culture through living in the city, joining selected clubs and societies at the University of Bath and Bath Spa University, and through volunteer and internship opportunities. This program incorporates a week-long residency at University College, Oxford University, and an extended excursion to Stratford-upon-Avon. Students who participate in this program can select courses in architecture, classical studies, history, literature, philosophy/religion, politics, theater and film, writing, women's studies, and education. A special division of the ASE program offers two courses in education: “The Theory and Practice of Teaching in England” and a school placement practicum in a local primary or secondary school. Highly qualified students may also be able to participate in internships. These are primarily for students interested in architecture, town planning, journalism, museum work and social services. Individual tutorials may be arranged for qualified students (3.4 gpa and above) for an additional fee. All HWS students are also required to participate in ASE’s cultural enrichment program that involves volunteering with a local organization. For specific information about courses and the program, please visit here and contact the CGE if you have questions. Due to the wide range of courses offered through ASE, this program can accommodate students from a variety of disciplines. It will be of particular interest to those studying architecture, classics, creative writing, education, English literature, history, theater, and those involved in the European Studies program. This program is open to all juniors and seniors in good academic and social standing with a minimum GPA of 3.0. Due to the challenging nature of study abroad, student academic and disciplinary records will be carefully screened. Students reside in furnished residential flats in the City of Bath with other US students in the ASE program. All of the housing is on a self-catering basis so students can prepare meals in their own shared kitchens as well as explore the many restaurants throughout the city. In addition to the Oxford residency, all students on the program participate in an excursion to Stratford-upon-Avon where they will spend much of their time in one of three Royal Shakespeare theatres. Students will attend a number of plays and will visit other sites managed by the Shakespeare Trust. In addition, course-related excursions may include London and Hampton Court, Wales, the Lake District, Oxford, Cornwall or other locations. Students will be charged standard HWS tuition and fees, room fees, and a $600 administrative fee. This will cover tuition for a four-course semester, health insurance, housing, and all program-related activities and excursions. Note that no board charge is included. Students should plan to bring their board fee to cover meal expenses throughout the program. While meal expenses will vary according to individual tastes, we estimate that $2200-$2400 should be sufficient for students who prepare their own meals. Additional expenses not covered include airfare and ground transportation to/from Bath, books, visa (if required), and personal expenses (laundry, entertainment and independent travel). We estimate airfare for this program at $900-$1000 from the East Coast, round-trip train from London to Bath at $150, books at $250, and visa (recommended, but required in some cases) at $125 (for limited student visa) and $500 (for Tier 4 visa). It is difficult to give an accurate estimate of personal expenses because student spending habits differ considerably. We would suggest a minimum of $1500 above and beyond meal expenses. However, students on a tight budget should be able to manage with less. If you are concerned about finances, we strongly encourage you to talk to the CGE staff who can offer information and advice based on your specific situation. NOTE: ASE has supplemental scholarships available to students who have been accepted to the Bath program. Please see Amy Teel at the CGE for information on how to apply for these scholarships. Please DO NOT MAKE TRAVEL ARRANGEMENTS for your program until you have received a notification from the CGE letting you know that the most recent version (your version) of the handbook (along with program start/finish dates) has been posted online and sent to your e-mail.